In Cheetah’s course “Effective Project Management,” we have students look at how they behave on projects and understand if that behavior is an asset or a liability to their project team. It’s been my experience most people’s intentions are positive even if others see their behavior as negative. People generally act with positive intent to further their own self-interests, yet at times may be unaware of how this could inadvertently create a challenge for another. These situations are common human dynamics and either build or bruise the project team. Creating greater awareness of how our individual behavior (regardless of our positive intent) impacts another and taking measures to adapt and adjust by all parties can build a stronger project team. Yet it is also dependent on how the person feeling challenged handles their experience. Addressing a challenge with curiosity and wonder rather than personalizing behavior or assigning a negative intent allows for more mutual discovery and reduces defensiveness. This way you can turn situations that could be a liability to the project team and make it an asset increasing understanding, respect, and compassion. Since projects are short duration efforts, theoretically we don’t have to work with project team members forever. This is why I find it fun to test new ways of interacting with others when things are not working out to my liking. When I focus on what I can change in me rather than on what someone else needs to change, I get a much better return on my time invested. Changing my approaches becomes an asset. Requiring someone else to change becomes a liability. Learn more about how you can improve your return on investment from your behavior. 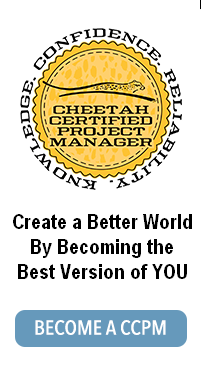 Take Cheetah’s Effective Project Management course. This entry was posted on Saturday, February 20th, 2016 at 11:44 am	and is filed under High Performing Business. You can follow any responses to this entry through the RSS 2.0 feed. Both comments and pings are currently closed.